I remember back when this book first came out and it started gaining quite a bit of hype. I read up on the synopsis which was extremely intriguing, especially because it mentioned a futuristic dystopian setting in the city of Toronto which is where I happen to be from. I decided to purchase it with a gift card I received for Christmas and it had been sitting on my shelf until now. Goodreads Synopsis: An audacious, darkly glittering novel about art, fame and ambition set in the eerie days of civilization’s collapse, from the author of three highly acclaimed previous novels. One snowy night a famous Hollywood actor slumps over and dies onstage during a production of King Lear. Hours later, the world as we know it begins to dissolve. Moving back and forth in time-from the actor’s early days as a film star to fifteen years in the future, when a theatre troupe known as the Travelling Symphony roams the wasteland of what remains-this suspenseful, elegiac, spellbinding novel charts the strange twists of fate that connect five people: the actor, the man who tried to save him, the actor’s first wife, his oldest friend, and a young actress with the Traveling Symphony, caught in the crosshairs of a dangerous self-proclaimed prophet. 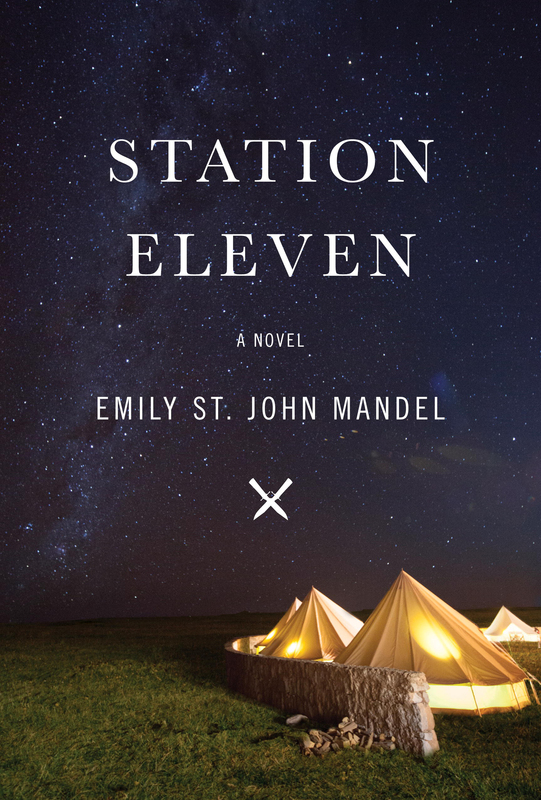 Sometimes terrifying, sometimes tender, Station Eleven tells a story about the relationships that sustain us, the ephemeral nature of fame and the beauty of the world as we know it. The first chapter opens up with a man named Jeevan who is attending a production of King Lear at the Elgin Theatre in Toronto. I found it a lot easier for me to picture this scenery and the city surrounding it as it was being described as I have actually been in this theatre and walked these streets in reality. Toronto has been my home for twenty three years, a.k.a. the entirety of my life and hearing these street names as the story progresses and we enter a dystopian future via an H1N1 style virus, made this future extremely easy to visualize. This storyline jumps to and from multiple time periods and character points of view. Usually this can be quite confusing and hard to follow, but in this case it made for a very unique way of telling the story of a very realistic apocalypse and how different characters have experienced it. We have the opportunity to see the fall of the human race from those who have lived on Earth for many years before the virus eliminated 99% of mankind in addition to the internet, electricity and travel. We also get to see it from the points of view from children who were either too young to remember the world the way it was before or who were born after the virus had happened. In addition to jumping perspectives, the story jumps time periods to moments well before the virus, as the virus was taking place and up to 20 years afterward. I loved this aspect to the story as it represented the life we take for granted and how the human race would react, adapt and survive something that wiped out every bit of technology we rely on as well as almost the entire population. This idea of an apocalypse was so realistic that I feel as though it could happen at any moment and reading this novel really made me think about how lucky we all are to have the things that we are so lucky to have. The characters were all fantastic and the way they are all connected without even realizing it was insane and so well written and thought out. Even after Earth has been wiped of 99% of people, it still felt like such a small world. The time period in which the apocalypse has yet to happen is told from a few points of view, mainly Arthur Leander, and later in the story, his friend Clark. I found the character of Arthur to be so well written. To go from his teenaged years where he longed to be a famous actor, to his later years when he realized that fame was not all he had hoped for. Clark was a surprise for me. He started as a minor side character and by the time you’ve reached the end of the story, he feels like one of the more important characters within the novel. As the virus has started to materialize and begun wipe out the population, the story is being told by Jeevan. Jeevan’s story was unique as it showed the initial instinct to adapt and survive. The story also fast forwards 20 years into the future, after the virus has struck and the remainder of the population has settled. This section of the story is mostly told from Kirsten’s point of view. Kirsten was just a child when the virus struck and the aftermath is the only world she has ever known. Of course there are going to be some fanatics after something as traumatic as the apocalypse and this story wouldn’t be realistic without someone who may have lost a few marbles. This is where we are introduced to “The Prophet”, the leader of a cult-like group of survivors. As stated earlier, all of these characters are connected in ways that are so well thought out. I didn’t expect anything to connect while reading, but it was beyond a pleasant surprise. This book deserved all the hype that it received and continues to receive. I highly recommend checking this book out as it can definitely be described as a story you never even knew you wanted to read. Definitely one of my favourite reads so far this year! Previous Post My Most Anticipated June 2015 New Releases!! !